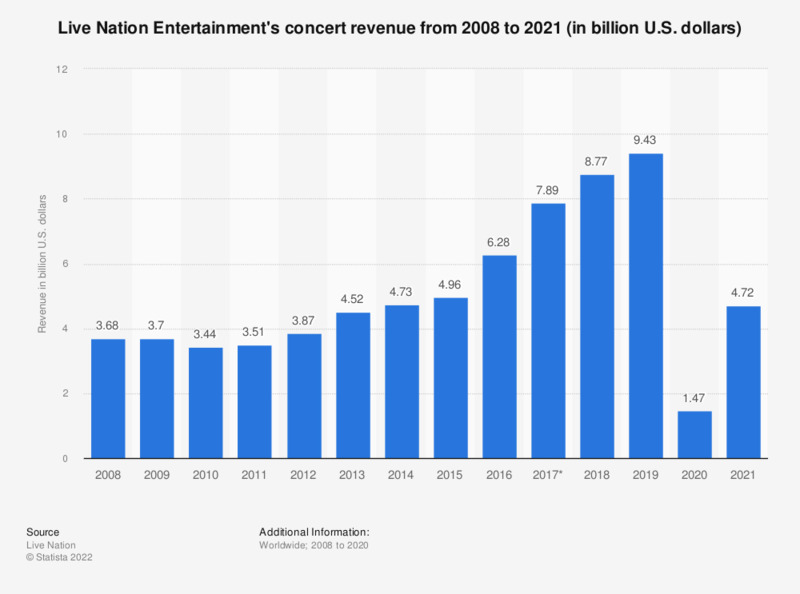 This graph shows the revenue Live Nation Entertainment generated with its concert business from 2008 to 2018. In 2018, the revenue amounted to 8.77 billion US dollars. Live Nation Entertainment draws revenue from the following segments of its activities: sponsorship and advertising, ‘Artist Nation’ (artist management services), ticketing and concerts. The concert business involves operating music venues and promoting the live music events taking place. In 2012, after two years of relatively weak results, Live Nation Entertainment managed to top its 2009 concert revenues, which amounted to 3.7 million US dollars. Growth in 2011 amounted to more than 10 percent and was the highest among all segments Live Nation operates. What is more, concert revenue made two thirds of Live Nation’s total revenue for 2012, firmly confirming the segment’s place as the most important revenue source for LNE. Live Nation Entertainment organized over 25 thousand concerts around the world in 2015. Live music is a popular and profitable form of entertainment. In 2016, the tour which brought in the highest revenue globally was the tour of Bruce Springsteen & The E Street Band, which generated over 268 million U.S. dollars. In North America, Beyonce ranked first, generating 169.4 million with her tour in the same time period. Live Nation's concert segment principally involves the global promotion of live music events, the operation and management of music venues and the production of music festivals across the world. Figures for the years 2008 to 2015 come from Live Nation Entertainment's earlier financial releases. *Beginning in 2017, the Company no longer presents Artist Nation as a reportable segment and now includes the business previously reported in the Artist Nation segment in the Concerts segment.